Larissa Explains It All...: Want to Win a Free Kindle?! Want to win a free Kindle? 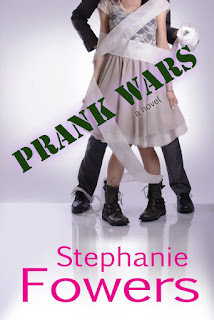 Stephanie Fowers is many things to me - a dear friend, an old roommate, a partner-in-crime, an adventurer extraordinaire, and most importantly for this post, an entertaining author to boot. Her first two books (Rules of Engagement and Meet Your Match) chronicle some real-life adventures we had when living together, so naturally she selected me as one of her judges for this little contest in honor of her latest book launch. Check out Stephanie and her contest. Check out Prank Wars. You won't regret it! Thanks for the heads-up, Larissa! I submitted two prank comments, so I'm crossing my fingers now. I've been wondering when she would write another book -- I have both of her other ones. Thanks Larissa for putting this up! And for being my brilliant judge. And yes, we HAVE had some fun and wonderful adventures together. Haha, this new book will definitely capture some of those as well, I must say! Shelli - if you have read her first two books, then you know WAY too much about my college experiences...cause most of those things? Really happened. Most of those things? I was involved with.